Not too long ago, there was some hubbub about LEGO coming out with “girl” LEGOs. I wrote a bit about it here. 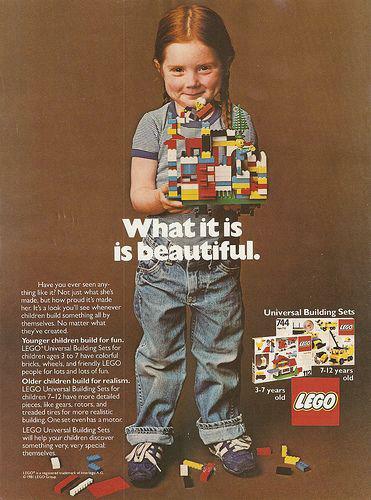 A LEGO ad from before all toys were gendered. 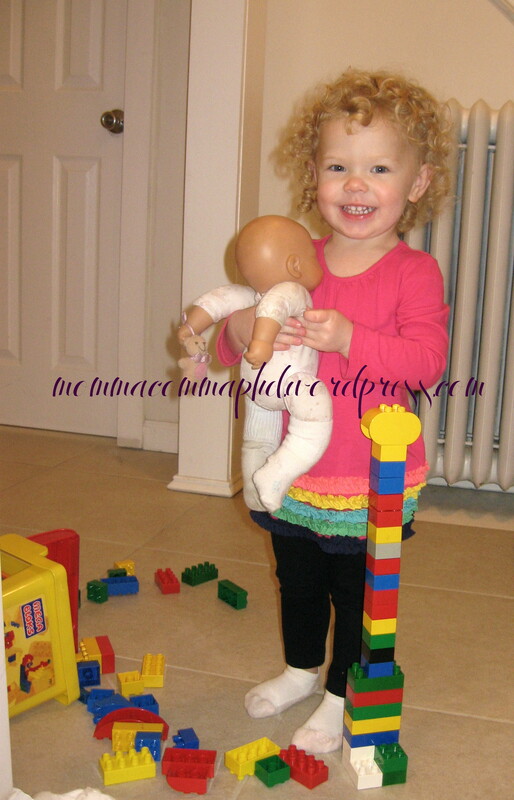 Mabel has been enjoying the hand me down Mega Blocks we have for a while now. However, she’s also recently gotten more excited about regular LEGOs. Over Christmas, we went to visit my in-laws and brought back with us all of Macs LEGOs from when he was a kid. That renewed Macs interest in them, and since then, he’s been picking up kits when he can and works with Mabel on them. She’s still a little young, but she enjoys building with them. It was timely when a rep from FIRST contacted me and asked if I’d help them spread the word about their newest competition, Jr FIRST LEGO League, this one for little kids involving LEGOs. 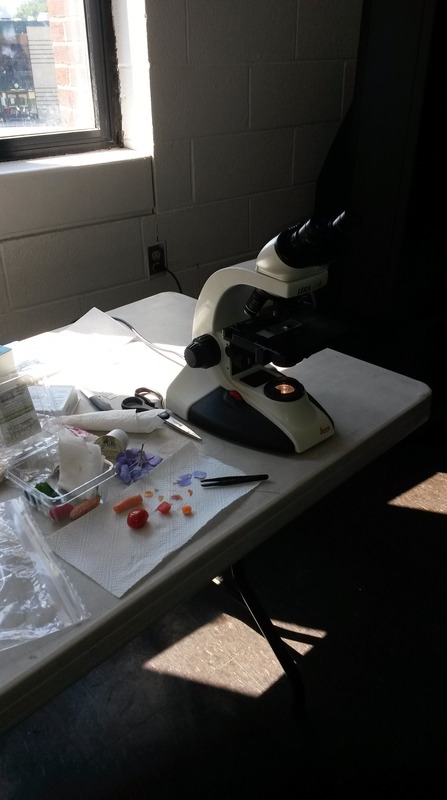 I wrote about FIRST last year– and how crucial it is to expose kids to science. More than 300,000 students around the globe participate in FIRST (For Inspiration and Recognition of Science and Technology)- an educational nonprofit that uses fast-paced robotics tournaments (and other events geared towards younger kids) to get kids pumped about engineering and science! FIRST offers four programs for kids grades K through 12; each one gets more complex as students work together to design and build custom robots and solve challenges. Before FIRST reached out to me last year, I had never heard of the program. In the past year, I haven’t been able to get away from the program! I’ve seen stuff on Twitter, read about local teams in the news, a recent event at the Javitz Center. I recently participated in the Lower Hudson Valley Engineering Expo and was thrilled to get to meet some of the kids from the Ossining FIRST team. They were all excited to talk about the program and their success. Mac brought Mabel and Nemo to visit me while I was there (so I could nurse Nemo) and Mabel got the chance to watch the robotics teams show off their handiwork. I was busy talking about bioengineering with middle and high school students, but Mac reported that she enjoyed watching the robots. 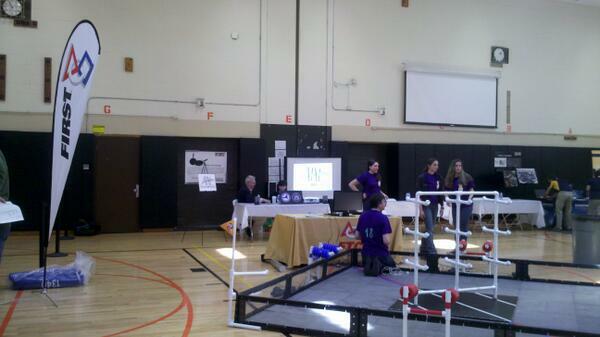 Local FIRST teams at the Lower Hudson Valley Engineering Expo. FIRST sent me a little starter kit to get an idea of what the program is like and how it engages kids and their creativity. It looks like a lot of fun- however, Mabel is still too young for it (it’s geared for K-3, ages 6-9). So, I’ve been in touch with my local library’s LEGO League (which isn’t associated with FIRST) and plan to donate the kit. Hopefully some of those kids will enjoy it and join a team! The ‘instructions’ that came with the kit are really just creative jumping off points- and I can imagine it is a lot of fun. (I want to stop imagining and actually try some of them with Mac- since, as you’ll see below, they are meant to demonstrate how creativity and problem solving differ even when two people are faced with the same challenge). The “Built To Express” Kit was developed by LEGO Education exclusively for the Junior FIRST® LEGO® League (Jr.FLL) program and encourages Jr.FLL participants to express their thoughts and ideas on any topic by building symbolic models with LEGO bricks. Build: Imagine that you and your team are a team of scientists working on a top secret project. Now, choose 10-15 of your bricks and build something you think you and your top secret scientist team would need in your top secret work. Share: Share the story of your model with your team. The other kit had more concrete challenges- where you work in pairs, both tasked with building the same thing, but working separately so you can’t see what the other is doing- you then reveal what you’ve built. I would guess this would wind up being fun to see the differences and similarities in how each approached the challenge. I think the various challenges would be a lot of fun to get kids building at our library’s LEGO League, or even at birthday party. 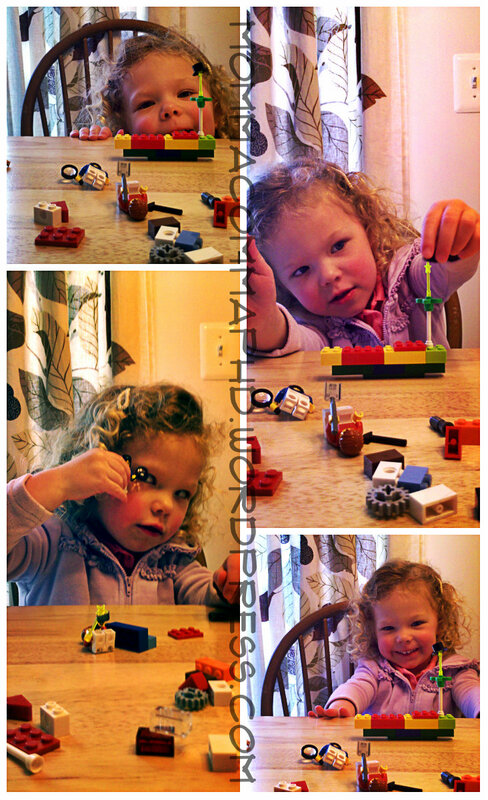 Even though Mabel is too young for JrFLL, it didn’t stop her from getting creative with the LEGOs in the kit. Can’t wait until she’s old enough to join a JrFLL team! I’m really looking forward to Mabel getting involved in FIRST programs once she’s old enough. They basically have competitions/programs for kids from kindergarten through high school with events and teams all over the country. The JrFLL, for the youngest kids looks like a lot of fun (and is noncompetitive). And for those nerd parents reading, perhaps you’ve even come across the FIRST themed xkcd comic? You can keep up with FIRST teams on Twitter! FRC Teams, FIRST Comm Team, FIRST LEGO League, FIRST Tech Challenge, or with the handy hashtag #omgrobots!